Mud is about a country boy who lives down on the river with his ma’ and pa’, not over in the city with those damn townies. His parents’ marriage is on the rocks, girls are a downright conundrum, and when he’s not helping his old man sell fish, he’s hanging out with his best friend, Neckbone. One day, the boy and his friend go exploring down the river in their dinghy. They come upon a deserted island and discover a motorboat that got lodged up in a tree during a flood. Much to their surprise, they meet the mysterious drifter who’s been living in that there boat: a smooth-talking fella’ who calls himself Mud. Rather than tell his folks or the authorities about his chance encounter, the boy decides to help Mud get off that island and reunite with the love of his life. But thanks to a whole bunch of bad dudes who are looking to looking to kill Mud, the boy winds up putting his neck on the line in the process. Now that I think about it, it’s actually not too far off from Huck Finn in a lot of ways. And given that this is a Jeff Nichols feature, that isn’t all that surprising. If the name isn’t ringing any bells, then prepare yourself for one doozie of a statement, because with only three movies to his name, Jeff Nichols might be the best American director out there today. I don’t expect everyone to start nodding their heads in unison on that one, but in my humblest of opinions, the writing’s on the wall. Don’t get me wrong, there’s no shortage of American-born film makers who’ve been doing their thing and doing it well long before Nichols entered onto the scene six years ago. But the thing that sets him apart from the bunch isn’t that he’s from Little Rock or that he just happens to make great movies, it’s that no one is telling American stories like his, stories born out of the DNA of our culture. First, there was Shotgun Stories, a Southern-fried family drama about violence begetting violence from one generation to the next. Then there was Take Shelter, an extraordinarily subtle character study of a good man struggling to do what’s right for his family at the risk of his own well-being and reputation. With Mud, we’ve got ourselves a good old-fashioned coming-of-ager about the innocence of youth and the high cost of trusting others. Like I said, might as well come with apple pie on the side. 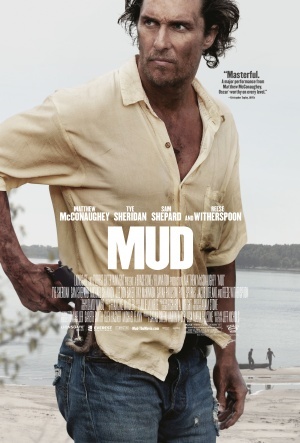 In this regard, it’s easy to see Mud as a natural progression of sorts, and it’s interesting because when I first saw the trailer for this movie I figured I had a good idea of what to expect. And while much of it is indeed driven by our boy Ellis helping our guy Mud and Mud’s true colors coming to light, it actually ends up being more about Ellis getting a hard-learned lesson on love. I don’t know if that’s gonna come as disappointing to some, but it shouldn’t. Maybe it’s because, like Ellis, my parents also split up when I was younger and largely affected my worldview on love and relationships in turn. I totally got the way he acts around his folks, the conclusions he jumps to in his own love life and his instant attraction to Mud, the spiritual Sigfried that he is. Granted, I probably would have loved this kid if he’d been raised by the Brady Bunch, but given his circumstances and how he gives himself so honestly to those around him, it only made me care for him that much more. You root for the kid, you want to see his worldview realized and the same goes for all the people he depends on. With that being said, it’s no stretch of the imagination to guess that not everyone in Ellis’ life lives up to the pedestal he puts them on. And for all the times that Nichols veers his characters away from trite behaviors and predictable circumstances, there are still a few occasions where the expected comes to fruition. On any other day, this could make for some awfully sappy moments that feel less like life and more like…something else. But not here, because on most other days we don’t get characters like these: recognizable people that aren’t prone to disappointment. And that’s one of the other big reasons I’m so fond of Jeff Nichols: the way he keeps inadvertently highlighting the things that drive me nuts about a lot of other movies. More specifically, the overwhelming amount of characters who inevitably disappoint for the sake of creating drama and the ungodly amount of characters who talk for the sake of talking. And that’s the thing about Nichols’ characters: when they have something to say, they say it, and when they don’t, they don’t. A little goes a long way in this regard and it’s a rule of thumb that I’ve tried to emulate in my own life. Since they speak when they have something to say, the words that come out have actual thought and substance to them. Their frustrations are felt as vividly as their appreciations, and the end result makes something simple feel special. Not to mention that it makes you so much more invested in a character and what they’re going through when their words have actual value. Folks, it’s a textbook example of actions speaking louder than words and the world would be better off if more writers got the memo. At any rate, whether it’s the dialogue, the plot or the air of mystery that’ll keep you wondering right through to the finish, it’s just a fantastic script in general that plays into Nichols’ established strengths. Plus, it also happens to provide every member of his cast with some fantastic material to work with. This really is one of those rare instances where it’s hard to single out just one performance because everyone’s operating at such an equally high level, and as far as problems go, that’s not a bad one to have. Matthew McConaughey gives one of the best performances of his recent “McConaissance” (really wish I could take credit for that one); despite being just his second feature film, it goes without saying I was quite the fan of Tye Sheridan as Ellis; and as far as big-screen debuts go, most kids would kill for a performance like the one Jacob Lofland gives as Neckbone (talk about some great names, huh?). Then there’s the absolutely hilarious turn from Michael Shannon as Neckbone’s uncle (yes, that Michael Shannon); Ray McKinnon couldn’t be more convincing as Ellis’ old man; and what’s not to love about Sam Shepard? Let me tell ya’, folks, this one’s a keeper. And bonus points to Nichols for putting one hell of an unexpected action scene together. Didn’t know the guy had it in him. So this is the first 9 I’ve given all year, and while I’m sure there’s more to come, I’d be surprised if too many others end up leaving such an impression. On its own, Mud is one of the finer, more genuinely affecting coming-of-agers I’ve seen in recent memory. It’s refreshingly simple and it earns each of its praises in ways that I wish were more commonplace. Not only that, but it earns them across board. What can I say, I’m just a sucker for real movies about real people. As the third effort from Jeff Nichols, it only furthers my admiration for the guy and bolsters my lofty hopes that, in due time, his contributions will be treated with the same kind of national reverence as those of F. Scott FItzgerald or the Coen brothers. Again, I may very well be in the minority on this one, but if all this acclaim is coming as news, Mud ain’t a bad place to start drinking the Kool-Aid. After all, what’s more American than Mark Twain? I’m hearing nothing but good things about this one! Believe the hype! Would love to hear your thoughts! Thanks, man! Just four more days to go. Hang in there. So good! Keep up the good typography. Great review, Aiden. I can’t wait to see this, Take Shelter was my favorite film of 2011 and I have high hopes for this as well. Thanks, man! Take Shelter was in my Top Five as well that year, still one of the few movies that I recommend like gangbusters to just about anyone who asks. Would love to hear your thoughts once you check this one out. Have you seen Shotgun Stories by chance? I’d love to, but I can’t get a hold of it. Do you have Netflix Instant by chance? Great to see us soulmating again, Aiden, even though I hate you for having seen it already when I haven’t. But I know I will love it. And just a couple of days ago I bet imaginary money on the fact that I am convinced that Nichols will become one of the most important directors of our generation. Hahaha. It’s a beautiful thing alright, and that bet of yours is going to pay off big time. You’ve seen Take Shelter and Shotgun Stories I take it? It is, it is. So far it’s the best movie I’ve seen all year. Oh buddy, you gotta amend that situation, if only for Shotgun Stories (and Breaking Bad, of course). Likewise! Glad you enjoyed it so much! What a great cast indeed.